This 357 Magnum cartridge by Magtech sports a 158 grain semi-jacketed soft point projectile. The bullet’s soft point will deform as it enters a target, causing it to expand to create a wide wound channel somewhat like a hollow point would. The bullet’s partial jacket facilitates in penetration so it can travel a little deeper within targets before expansion occurs and further helps to prevent excessive lead fouling in a pistol’s bore. That this bullet’s tip is flat also makes it good for shooting paper targets. Really, you’ll find that this versatile bullet performs admirably whether you would implement it for plinking, training, or self-defense. This round further offers a Boxer primed brass casing, which is ideal for handloading. In Magtech’s short time in business their high quality components and thorough quality assurance program have made them an extremely popular brand throughout the world. 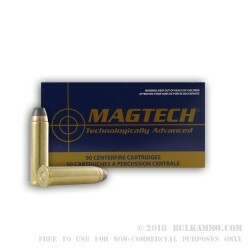 Many law enforcement professionals and shooting enthusiasts alike swear by Magtech -- these 1,000 hard-hitting rounds are certain to show you why.